Why come to MIC’s Open Day? Both the Limerick and Thurles campuses are conveniently situated in central locations. We would advise that you plan your trip well in advance and make use of public transport and bus services where possible. Click on the Direction links for route options to each campus. Important Note: The free shuttle bus service running between MIC, UL and LIT at the October Open Days will only run between the campuses and the designated stop-off points on each one; there will be no unscheduled stops. Mary Immaculate College, Limerick is located between the South Circular Road and the Dock Road in the leafy southern suburbs of Limerick City. From Limerick City: Travel straight up O’Connell St. and O’Connell Avenue until you come to Punch’s Cross then turn right onto New Street. At the end of that road continue straight at the roundabout onto Courtbrack Avenue. The entrance to the College will be on your right. From M7/N18 Motorway: The College is located on the South Circular Road just off the main M7/N18 Limerick/Dublin motorway. Take exit 2 off the N18 (M7) towards Dock Road / City Centre. Turn right off Dock Road at James Barry Motors onto Courtbrack Avenue. The entrance to the College will be on your left. 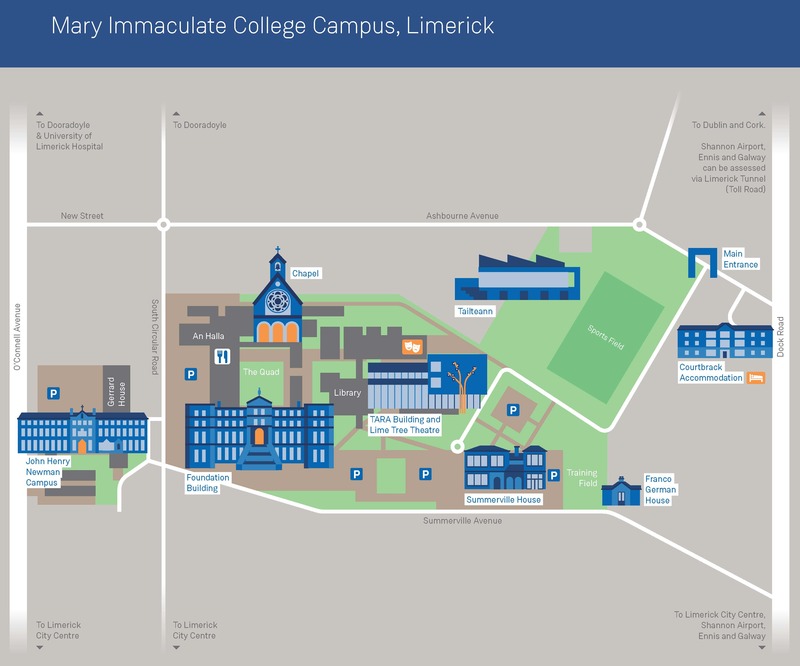 Mary Immaculate College is just a 15 minute walk from Limerick’s Train and Bus Station, Colbert Station. From there, regular Irish Rail and Bus Éireann services conveniently connect Limerick to towns and cities throughout Ireland, including Dublin, Cork, Tralee, Killarney, Ennis, Tipperary, Waterford, Galway, Westport and (via Dublin) Belfast and Sligo. Find the campus on Google Maps; via Loc-8 code or using Eircode, V94 VN26. MIC, St Patrick's Campus, Thurles is located on Cathedral Street; the entrance is directly across from the Cathedral of the Assumption in the town. From M8: Take junction 6 and first exit onto N62, turn right, turn left onto Mill Road and at the roundabout, take the first exit onto Kickham Street. At the roundabout, take the first exit onto Cathedral Street. Turn left into MIC, St Patrick's Campus, Thurles. From M7: Take junction 25, take the R498 exit to Nenagh/Thurles. At Tipperary Institute Roundabout, take the second exit onto Castlemeadows/R498 and continue onto Parnell Street/N62. Continue onto Liberty Square/N75 and turn right into MIC Thurles. The College is just over 10 minutes' walk from Thurles Train Station while regular buses stop in the town centre. See Irish Rail and Bus Éireann for details on services to towns and cities throughout Ireland. Find the campus on Google Maps or using Eircode, E41 C424. Located a short walk from the social and cultural buzz of Limerick City centre, MIC Limerick’s leafy 25-acre campus combines architecture from past and present that makes it truly unique. The essential facilities for lectures, study and recreation are all here but its compact size and friendly atmosphere ensures that students have ‘a home away from home’. Founded in 1898 to train primary school teachers, Mary Immaculate College has come a long way since the first students stepped through its doors. MIC is now a thoroughly modern institution, delivering a variety of education and liberal arts programmes to close to 5,000 students. It may be the oldest third level college in Limerick but the transformation of the campus, particularly over the last 20 years, shows a drive to offer the best amenities possible. It maintains a historic charm with period buildings and fixtures but boasts contemporary facilities like the TARA Building, Lime Tree Theatre and Tailteann Sports Complex to complement the vibrant student experience. MIC Limerick is a strong fixture in both the local community and the national educational landscape. Explore the campus in more depth below. MIC, St Patrick’s Campus is situated right at the heart of Thurles Town and its heritage. Though it still has its original 19th century buildings, much of the site has been completely refurbished and refitted to the highest modern standards in recent years. From the spacious, manicured grounds to the first-rate academic provision to the warm ambiance, MIC Thurles provides an ideal setting to pursue higher education. Established in 1837 as a second-level school, it became a major seminary a few decades later and remained so until the early 2000s. St Patrick's College (as it was known before it was incorporated by MIC in 2016) welcomed back lay students to its first Bachelor of Arts programme in 1988 and the first BA in Education degree began in 2003. Now, there are five BA in Education programmes available here, with various subject combinations, delivered by staff from both the faculties of Education and Arts at MIC. Degrees qualify students to teach in post-primary schools. The College is characterised by an amiable relationship between faculty and students, ensuring a relaxed atmosphere around campus. Small class sizes guarantee students an interactive and engaging learning experience. The MIC Thurles campus has a range of high quality facilities to support the equally high standard of teaching and learning at the facility. It underwent a massive regeneration between 2002 and 2005, and further upgrade works were carried out in 2016 and 2017, including the addition of brand new on-campus accommodation. There is also a full-scale GAA pitch onsite and other sports facilities include tennis and basketball courts, and a handball alley. Explore the campus in more depth below.